Video of Franklin, originally uploaded by Mon@rch. Almost 18 months ago we placed a transmitter on this box turtle to be followed one a week through the hills of Allegany State Park. We will be removing his transmitter this week and no longer be following him!! We got some great data from him and time for him to continue to do what he does best!! This video was from late summer while he was on the move! 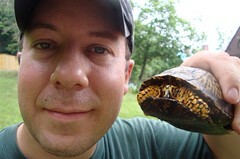 I will be doing slide programs on this turtle . . . so look for me at your local bird club. This entry was posted on 16 October 2011 by mon@rch. It was filed under iPhone .